Our children’s services are there to protect and care for vulnerable children in our communities, providing a lifeline for children in difficult situations. But doesn’t it seem wrong that private companies are able to run these services and prioritise profit over the children they are meant to protect? The government recently dropped its unpopular plans to reduce council responsibilities to vulnerable children, which could have opened the way for private firms into our child protection services. However, nowhere else in the world are for-profit companies given the same powers over children’s services as here in the UK. We need public ownership to make sure that children are put before profit in our children’s services. Private sector companies already dominate many of the children’s services in our communities. 65% of children’s residential homes are run by the private sector and private equity firms run two of the three biggest foster placement providers in the UK. In 2014 the government tried to allow councils to further contract out and privatise children’s services but was forced to back down after strong opposition and campaigning by social workers and charities. In 2016 the government tried to reduce local councils’ duty of care to vulnerable children, leading to fears that this would open the door to private companies in child protection services. Our polling showed that fewer than 1 in 5 of you trusted the government’s plans for vulnerable children. Only 1% of social workers trusted the government not to privatise if these plans went ahead. This year, with such strong opposition to its proposals, the government decided to drop its dangerous plans. 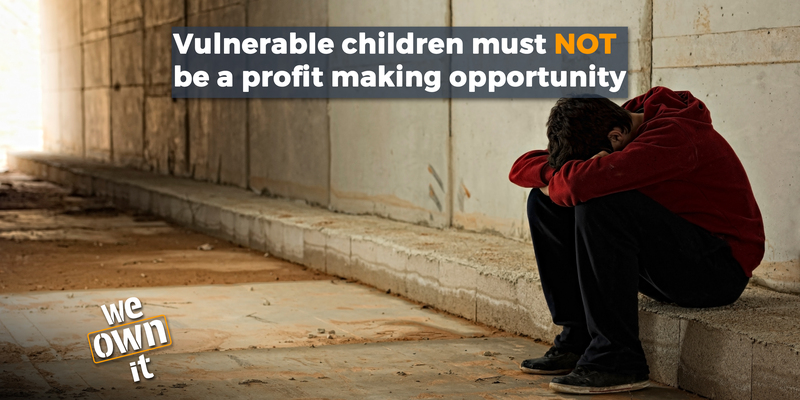 The Children and Social Work Bill proposed by the government would have enabled cash-strapped local councils to opt out of their legal duty to care for vulnerable children, further opening up the sector to for-profit companies. But why would we do this? 1/3 of the 130 children’s homes run by the US private equity firm GI Partners are already rated below a ‘good’ standard. This is also true for 28% of all privately run children’s homes in the UK, while 63 privately run homes fall into the worst ‘inadequate’ category. The private company G4S has already failed children in our youth prisons, yet the government is still planning to allow G4S to care for children held in detention centres - this would be awful. The government has already piloted the idea of privatising children’s services and removing regulation in 6 parts of the country. The pilot found that contracted-out organisations struggled to provide children in out-of home care with the consistency and continuity they require - and it did not save the public money. After this pilot, the government even admitted that the public sector is a better fit for our children’s services. Government cuts are putting pressure on local councils to outsource children’s services in exchange for short-term cash, but this will not save us money in the long-term. In 2015, the Personal Social Services Research Unit revealed that placements in privately owned children’s homes cost £4000 per week, while those in local authority care homes cost £3000 per week. Despite a quarter of privatised children’s homes not providing adequate levels of care, privately run homes still receive a disproportionately large amount of our funding. But this doesn’t just impact upon the public purse, it also affects the children who are cared for by these services. The higher costs of privately run children’s homes is worrying as it further encourages the placement of children’s homes to be driven by property prices not the needs of vulnerable children in care. Already over a quarter of children’s homes are located in the North West compared to just 6% of homes being in London, despite the capital having the largest and youngest population in the country. This means children in care being moved further away from friends, family, and caseworkers as councils and companies try to cut costs. The great thing about local authorities running our children’s services is that they are regulated. In contrast, private companies and charitable organisations do not have to be rated or inspected by Ofsted. Public ownership also increases accountability – we elect the people who run our children’s services, so we can hold them to account. The same can’t be said for private companies. This is why public ownership is the best option for our children’s services. Read more about the successful campaign to save children’s services on the Together for Children campaign’s website.